The legal industry is ripe with inefficiencies with regards to digital document management, records management and sign off. The industry itself seems to be moving slowly to close the gap that it is creating between itself and other industries. Digital innovation can take many forms, without the changes being hard to introduce. For the most part, these innovations cannot only improve workflows and processes within the company but also improve the standards of employee’s work and take some of the pressure off of legal professionals. 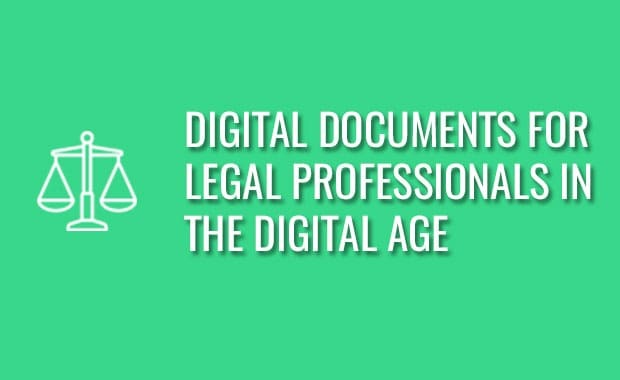 This article will delve into the digital innovations within the legal industry in order to highlight how digital document and records management solutions can be introduced without the need to change the culture of a business drastically. For the most part, these systems can be easily integrated so that it is a quick changeover with minimal disruption to the daily roles of team members. Within the legal industry, there’s a lot of information that needs to be gathered for many different reasons. Most of the time this is done using paper and pen as opposed to digital means. This, in turn, results in the need to manually enter information into a digital filing system. This is called data entry and it can be unreliable, while also taking up much of your employees precious time. Consider how much time your employees take every day manually entering data into the computer system when you can automate this process by using digital data collection efforts. Now contemplate what they could be doing with this time if they didn’t need to manually do this task. The benefits are endless when you examine this tiny but integral part of the daily role of most paralegals and administrative staff. The paperless office movement has been around for many years now but in order to create a digital document solution that encompasses workflows and processes within your business, c-level staff need to look deeper. Identifying areas where the majority of the paper is used, discovering new technologies that fit the company’s future strategies and uncovering a document solution that grows as your needs grow is hugely important to ensure that the results are long-lasting. Highlighted below are features of PDF technology that can solve issues within the legal industry in an innovative way with the ability to expand as your company needs do. The legal industry has collected information through paper forms for decades. The next step in this process would be for you to transfer this information from the paper into a digital format. An innovative and digital way to improve this system would be to use PDF forms that can collect information quickly. That information can then be transferred, through an export file, to your database, where it can update a pre-existing profile or create a new profile so that you no longer need people to manually update sensitive client information. Using PDF forms, templates can be created where uniform information can be collected from each client without you or your client needing to recreate or re-enter information multiple times. This could be the perfect way to automate your records management system without needing to schedule unwanted face to face or over the phone meetings. As a lot of information is kept in paper form, the legal industry is known for its high costs in storage and interminable file rooms. With this brings high insurance costs and the risk of losing everything through a myriad of different potential accidents. Using PDF technology you can move all of this paper information into the digital document management system that is cheaper and safer to upkeep. By scanning paper documentation using our innovative OCR technology, these paper documents can truly be turned into digital documents, which are PDF/A compliant, searchable, and most importantly, findable. Furthermore, because the legal industry is fast-paced and ever expanding, there is an increasing need for legal services across borders. This means that practitioners are stretched very thin and don’t have the resources to spend 12 hour days in the office ensuring that all paper documents are converted to a digital format. A great reason to move to a digital document management system would be that you can use tablets, smartphones or other digital devices on the go to review documents, update information and take notes. All this can be done without needing to be connected to the internet on a full-time basis. Once you have updated a document you can connect to the internet and see the file save in front of your eyes. Within the legal industry, security is a pivotal aspect of any document management strategy, to ensure that personal information is not viewed by the wrong people. PDF technology allows for redaction and other security features within PDF documents. For example, a PDF document can be password protected so only certain people are allowed to view or edit it. PDF security features are great to ensure that your company is 100% compliant with GDPR and other data protection regulations you may need to abide by. Foxit PDF SDK allows you to integrate PDF technology into your workflow or application seamlessly without needing previous knowledge of PDF. We also add new features to our SDK regularly to ensure that customers have what they need to improve their workflows and processes. Below are two features of our PDF SDK which are perfect to improve document management systems so that communication and collaboration is improved, while allowing for maximum flexibility and efficiency. PDF technology allows for files to be added to PDF documents. This means reference files can be added to PDF documents so that users can get a full picture of the topic within a document without the need for continuous communication. This makes reviewing, collaboration and sign-off fast and more efficient. //Associate 1.txt with catalog dictionary. //Associate 1.txt with page dictionary. //Associate 1.txt with annotation dictionary. Another great feature in PDF documents is embedded fonts. This feature allows you to embed a particular font that you’re using within your document. When a person opens the document it will render exactly as you intended regardless of if they have the font installed on their local machine. Embedded fonts reduce the number of errors in review processes while also increasing efficiency due to the ease of viewing. // Add a new PDF page and insert text objects.